My eldest daughter likes buns, all kinds of buns. She associates different buns with different people and places. She asks for them from people who have supplied them in the past. Her grandfather (Hammy) gives her fairy cakes with dolly mixture faces. Her Aunty Ger supplies an abundance of cupcakes from farmers markets. Uncle Aran’s 70% chocolate brownie was her first love. She is on first name terms with Emer in our favourite bakery, Goyas. Most Saturdays sees her with her face pressed up against the glass display case, eyeing up the lemon meringue and millionaire shortbread. She got her first cookbook at Christmas and it was the bedtime story book for weeks after. 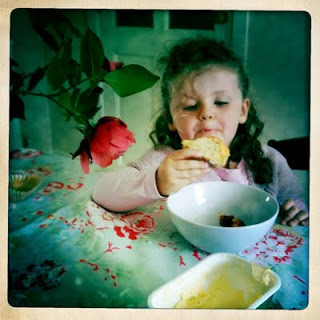 (though I must confess it is very dull to read recipes aloud) She says she would like to be a ‘makery’ when she grows up. All in all, this is one apple that did not fall far from the tree. Put a baking sheet in the oven at 220C/200C fan/gas 7. Put the flour, salt and baking powder into a food processor, then whizz in the butter until it disappears. Pulse in the sugar, tip into a large bowl, then make a well in the middle. Warm the yogurt, milk and vanilla together in a pan or microwave; it should be hot and may well go a bit lumpy-looking. Tip into the bowl and quickly work into the flour mix using a pallete knife. Stop as soon as it’s all in. Tip the dough onto a floured surface, then, with floured hands, fold the dough over a few times – just enough to create a smoothish dough. Press out to about 4cm/1½in thick, dip a 7cm cutter into more flour, then stamp out 4 rounds, flouring the cutter each time. Squash the remainder lightly together, then repeat until the dough is used up. Brush tops with egg wash, scatter flour over the hot sheet, then lift the scones on. Bake for 12 mins until risen and golden. Best eaten just-warm, or on the day. I love your children. ‘Makery’ is such a great profession, no? Thanks Mona, she would make a fine maker, as does our Ron!